North Sails will be the Official Regatta Support Partner for the 2014 J/70 World Championship presented by Helly Hansen, which starts September 8-13 in Newport, RI. The North U Regatta Services team will be onsite working with sailors to improve their boat setup, rig tune and sail trim. Available to all competitors, expert sailing performance analysts Andreas Josenhans and Chuck Allen will offer on-the-water performance analysis followed by daily photo/video debriefs. Additionally, North Sails’ J/70 class experts will host dock talks immediately after sailing throughout the regatta; North’s sail care van will be available to pick-up and drop-off sails needing overnight repair; and North Sails has partnered with Sailing Weather Service to provide free detailed daily weather forecasts for all competitors. “The J/70 Class is exploding right now,” said North Sails President Ken Read, who will kick off the week at Sail Newport on Sunday, September 7 with a local knowledge presentation followed by the North Sails-hosted J/70 Worlds Welcome Party featuring beverages from local brewery Newport Storm. “North Sails has been a supporter of the boat since its inception, and we’re proud to sign on for J/70 Worlds. 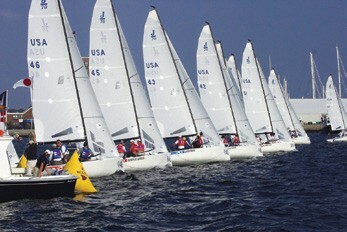 Newport is the perfect venue and the New York Yacht Club will ensure the regatta is well run. We look forward to welcoming all J/70 sailors, especially the international competitors, to Newport in September.” For more information, visit j70worlds.com.